The following list of Wigton Vestry Members, 1788, 1822-1834 is drawn from the vestry minutes. The year 1828 is not included. In most years the occupation or status of the person was also recorded. Where possible these have been checked against entries in trade directories. Some occupations not included in the minutes have been taken from the directories. 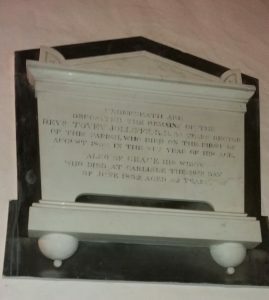 According to his memorial in Carlisle Cathedral, Thomas Wilson was prebendary for 21 years and dean of the cathedral for 14 years from 1764. He died on 25 September 1778, aged 63. Wilson attended Giggleswick School and Christ’s College, Cambridge. He was ordained in 1742 and became vicar of Torpenhow in 1743. The following year he married Margaret Morley, the younger daughter of John Morley of Beamsley Hall. She died 2 February 1780, aged 62. 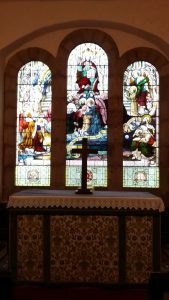 Thomas and Margaret had two sons, the elder, also called Thomas (1748–1812), also took holy orders and became vicar of Corbridge (1773–1784) and, from 1785 until his death, rector of Distington. He also served as vicar of Brigham (1797–1812). Wilson was a witness to the Jacobite Rebellion of 1745 when Prince Charles Edward Stuart returned from exile and launched his bid to take the English throne. After taking Edinburgh, his forces defeated George II’s army (commanded by Sir John Cope) at Prestonpans, and marched into England. The garrison at Carlisle Castle surrendered to Charles’ army. When the prince’s army marched southwards, around 100 Jacobites remained in Carlisle. The Jacobite army reached Derby before retreating. They returned to Carlisle where around 400 faced a siege led by the Duke of Cumberland. In the face of the siege they surrendered, and many were subsequently executed. The conduct of this place has been strangely misrepresented, and the people now in it are not looked upon as faithful and good subjects. I’m persuaded when truth comes out and circumstances are fairly stated, Carlisle will be pitied, and allowed to suffer on all hands. A demand made … in the Duke’s name, of the bells of our Cathedral … was a surprise upon the members of the Chapter here. It was a scandalous, unprecedented, and illegal demand … Things are settling here, and I hope in a little time we shall be better thought of, and better treated … It will be sometime yet before it be safe to have service again in the Cathedral. Proper methods I’m assur’d will be taken to have it purifyed’. No further demand has been of our Bells … You may imagine better than I can describe the condition the Rebs. left the Parish Church in, for yt was their prison: I was given to understand the damage it suffered wd. be made good, but upon enquiry no further power was given than to the cleaning and washing of it. This proves of little use, for the flags being old, spungy and ill-laid, the earth under then is corrupted; and till that is removed the Cathedral Church will not be sweet, nor will it be safe to have a service in it. George Gill Mounsey, Carlisle in 1745: Authentic Account of the Occupation of Carlisle in 1745 (London: Longman, 1846). Thomas Greenup farmed Stainsgill at Culgaith in the parish of Skelton. The overseers vouchers of Joseph Turner, Matthew Cowper and Thomas Thompson for the years 1772-1775 with regard to expenses paid out for the poor show that Greenup was receiving large amounts of money throughout the year from the parish. On three occasions for £11.13s.4d ( 2 March 1773 , 15 May 1775 and an unknown date), once for £11.8s.4d (25 May 1772) and on another occasion for £23.6s.8d. A payment in 1772 says that it was “for the use of the poor”. In 1775 the payment is listed as “to expenses at to letting the poor”. It is not known if this was for accomodation or work or something else to provide ‘outdoor relief’. He rented a farm from Matthew Atkinson of Temple Sowerby from at least 1772. The farm was advertised for sale in Cumberland Pacquet and Wares Whitehaven Advertiser 18 June 1782 . After six months the farm had still not sold and was offered on a tenancy basis of £200 per annum, the amount that Thomas Greenup was paying . 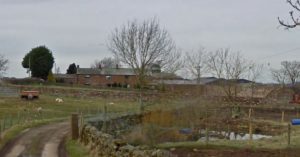 It was described as a large freehold estate and farm consisting of a new Farmhouse, Barns, Granaries, Stables and Outhouses with 200 acres of pasture land as well as a further 280 acres of enclosed land. Subsequent vouchers may provide information as to the exact use of this money. Researched and written by Margaret Dean. In 1833-34 John Tordiff’s name appears on a Church Warden’s bill for the Parish of Wigton for the supply of wine at a cost of £1.10.0. The bill was settled by Henry Hoodless, Stationer, Wigton. On the reverse side of Tordiff’s bill is a second bill for registers from Mr Hoodless for £5.10.0. It is from this side of the bill that the date is assumed. The surname Tordiff is quite common in the Wigton, Holme Cultrum, and West Cumberland area, therefore, John Tordiff’s movements prior to this bill and business as Spirit Merchant in Market Street, Wigton, cannot currently be discerned with certainty. On 29 August 1833 Tordiff married Mary Russell (b. 20 May 1808) in Whitehaven. Her father, John Russell, worked as a maltster. Shortly after the marriage Tordiff took over the grocery premises of John Meals in the Market Place, Wigton. John Meals’ name also appears on the same bill for the supply of wine (and on sveral other vouchers). Meals eventually retired to Cockermouth with his wife Mary (née Brown). In the 1851 Census the Meals were living in Castle Street. Meals died in 1857. Prior to this, Meals had placed a notice in the newspaper stating that he had relinquished his business and informing the public that John Tordiff had taken over his stock. In the practice of the time, Meals hoped that the public would favour Tordiff with its business. In the Carlisle Journal there is further evidence of Tordiff in Wigton; an advert for the sale of a freehold estate at Hayton. The property was being sold at the Sun Inn, the house of John Cloag, innkeeper, Aspatria on 31 July 1834: ‘Particulars may be known on application to John Tordiff of Wigton Spirit Marchant’. Tordiff had also been acting as umpire in a horse race involving a wager between John Kidd, a Mr Pattinson, Mr William Buttery (erstwhile assistant overseer of Wigton) and a Mr Simpson. By August 1834 John and Mary Tordiff had a son, John Russell Tordiff and all appeared to be going well. By December 1836, however, Tordiff’s fortunes were changing. His business ceased trading. In effect he has been declared bankrupt and those appointed to settle his estate were charged with the task of calling in the money owed to him so that they can pay his creditors. In February 1837 a dividend of 10s was paid out to creditors by the assignees at John Hewson’s office. Tordiff’s business was taken over by Daniel Harrison. After this episode, John and Mary Tordiff went to Liverpool, where a daughter Hannah Elizabeth was born in 1838. There is no information as to his circumstances or if he was in business. He would only have been allowed to start a new business, however, once a certificate of discharge from his bankruptcy had been declared. All did not go well. On May 5 1839 an inquest was held at The Grapes, Church Row, Aldgate London on John Tordiff, aged 35. The suggestion is that he may have taken his own life as two phials of laudanum (a preparation of alcohol containing the opium derivative morphine), were found with his body. He had been living for a month at the Three Colts, Old Ford, and was employed by Messrs Chapman, distillers. It is here that Tordiff’s wife had sold some stock from the funds at a disadvantage. A nurse who gave evidence said Tordiff had been in the London Hospital and had told her he had taken laudanum before. Bell’s Weekly Messenger reported his death as a ‘Determined case of poisoning of a decayed merchant’, stating that he had formally been in a very extensive way of business. Examination of his body showed he had led a dissipated life. It would seem that John Tordiff died by his own hand either by accident or on purpose. He was buried at St Botolph Without, Aldgate, London May 1839. John Tordiff’s wife Mary, aged 30, went to Aspatria with their children John Russell and Hannah Elizabeth aged six and two respectively. She took up work as a schoolmistress. On 26 July 1845 she married spirit dealer Robert Graham (b.1821 in Distington, Cumberland) and had two further children: Mary Jane (b.1847) and Dorothy (b.1851). They can be found at Scotland Road, Liverpool, on the 1851 Census along with her and John Tordiff’s children John and Hannah. In 1861 Mary was widowed again but carried on Graham’s business as a victualler. Death notices in Gore’s Liverpool General Advertiser 4 April 1867 and the Liverpool Mercury 2 April 1857 reported the death of an Elizabeth Tordiff age 81 at 36 Lodge Lane. For 40 years she had been the landlady of the Rams Head, Workington and latterly nurse at the Deaf and Dumb Institute, Oxford Street, Liverpool. According to the 1841 Census Elizabeth was living in Toxteth, Liverpool, and then at the above Institute in 1861 as a widow and Sick Nurse. It is possible that this is John Tordiff’s mother. Hannah Elizabeth Tordiff (1838–1906) married William Wilson (a pilot mariner then dock worker) in Liverpool on 7 December 1861 and had five children: Alex Poole, Dorah, William R., Harold W. and Isabella. John Russell Tordiff (1834–1871) was in business with a Benjamin Lambert prior to the dissolution of the business in1868. He also was a book keeper dealing with accounts, and lived with his sister’s family prior to his death on 9 May 1871. His death announcement in the Carlisle Patriot 19 May 1871 states he is the son of John Tordiff late Spirit Merchant of Wigton. John Lightfoot was born on 14 December 1774 in Wigton, Cumberland, the eldest son of Isaac and Hannah (née Osmotherley). He received nothing in his father’s will of 1817, in fact this will detailed he was required to pay £640 owing to his father to fund bequests to his three younger brothers. However, John was a certified attorney of law in the town by this time and his own will of 1840 left bequests to his wife and children. John married Betty Tiffin on 6 June 1801 in Wigton and they had seven children; five sons and two daughters. His will, after settling of just debts and expenses, commences with the female family members: to his dear wife and daughters Mary and Hannah (if my said wife shall continue my widow and not otherwise and my two daughters continue sole and unmarried) he bequeathed all his Freehold Messuages, Tenements, Lands, Estates, Hereditaments and appurtenances of what nature, tenure or kind whatsoever in the town and parish of Wigton, County of Cumberland) now in the several occupations of Mr John Donaldson, Mr Joseph Studholm, Daniel Cassons, John Knipes, Jonathan Peat and Isaac Lightfoot, for and during the term of their joint lives. Upon the marriage of his daughters they were to retain control of their property independently of their husbands; a marriage settlement commonly used by people in business and owners of property. He also bequeathed all furniture and other household effects (plate, linen, china, glass, books, prints, pictures, wines, liquors, fuel, and consumables to his wife and daughters (as before). If his wife died or remarried then these goods were to go to the daughters but divided as his widow decided. His bay horse and gig were left to his wife and daughters. Upon the death of the ‘last liver or survivor of them’, he devised that all his freehold messuages etc were to be divided equally to and amongst his five sons – John, Robert, Joseph, Isaac and Rook Tiffin in equal shares and to share and share alike. He requested that his son Rook Tiffin had the preference in purchasing his brothers’ shares in the Upstreet houses and premises, Joseph in the Knipes Shop and rooms above and Isaac in his own shop and rooms above. The next part of the will seems to contradict what he has said earlier on because it says if his wife remarried or died or his daughters married, then all his property is to be re-divided equally amongst his seven children. He bequeathed all his law books, papers, writing desks, ‘clossetts’, iron safe and other portable articles from his two offices to his son Rook Tiffen together with his grey mare and stock of hay. He bequeathed to three of his sons (Joseph, Isaac and Rook Tiffen), wife and daughters the sum of £20 to be paid them within one month after his death. Anything else remaining was to go to his wife and daughters as stipulated earlier in the will. The will was signed by John Lightfoot on 13 September 1839, witnessed by J.G. Willins and John Knipe with his dear wife as sole Executrix. A Codicil was added on 10 January 1840, 1 month before his death on 11 February 1840. This was to be taken as part of and annexed to his last Will and Testament and bequeathed to his youngest son, Rook Tiffen, all his freehold customary or copyhold Lands, Estates and Hereditaments lying and being at Kirkbride in the parish of Kirkbride in the County of Cumberland to hold to him and his heirs. The will was witnessed by Peter Pearson and Joseph Nixon. Effects valued at under £300. For further information on the Lightfoots see the blogs on posted on 31 July, 2 August, 3 August and 23 August 2018. The Ballantine family inherited the seat from a younger branch of the Musgrave family of Edenhall Anne Musgrave marrying Sir John Ballantine JP [1632-1705] of Corehouse Clydesdale, he was knighted in 1663 and High Sheriff of Cumberland in 1694. Their son William Ballantine [d 1710] was High Sheriff 1709 he married Grizell daughter of Sir James Johnston of Westerhall without his father’s consent. Their son John Ballantine [1699-1756] High Sheriff in 1726 married Jane daughter of Frecheville Dykes. Dr. William Ballantine was their son, he was baptised 7 December 1736 in Bromfield Church. Marriage On the 28th of February 1774 William Ballantine surgeon bachelor aged 38 married Jane Porter spinster aged 22 in Wigton Church both were of the parish of Wigton & were married by licence. Dr William Ballantine appears in the Consultation Letters of Dr William Cullen (1710-1790) at the Royal College of Physicians of Edinburgh. Dr William Ballantine is also mentioned in two other cases. The sale of William’s premises shop & dwelling house 15 April 1805 at the King’s Arms Wigton is advertised in the Cumberland Pacquet of 5 April 1805. Deaths Thursday the 1st inst. in London, in the 78th year of his age, Mr William Ballantine; many years an eminent surgeon at Wigton, and of the ancient family of the Ballantines if Crookdake, in this county. 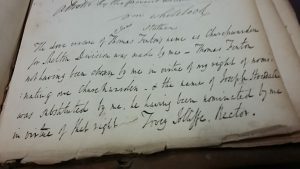 The handwritten order above, dated 29 April 1773, from Thomas Wilson, Justice of the Peace and Dean of Carlisle Cathedral, has raised a number of questions about the relationship between Wilson and Isaac Lightfoot, the Overseer of Wigton. On the face of it, it seems very straightforward. Pauper Joseph Blackburn had applied to Lightfoot requesting assistance for himself and his family. Lightfoot refused. Blackburn appealed the decision by applying to Wilson. This was part and parcel of the Poor Law process. If they were not satisfied with the decision made by an overseer, claimants could go to the quarter sessions and ask the magistrates to review it. As happened in this case, magistrates could overrule an overseer’s decision and stipulate what provision should be made for the claimant. This is a handwritten order, but what is interesting is that there are two different colours of ink used. Most of it is in black including the statement that Lightfoot had appeared before Wilson but had failed to show sufficient cause to explain his refusal to assist Blackburn. Blackburn’s name, the date and the amount to be paid over, however, are all written in a sepia colour. This raises the possibility that this was not an isolated incident. The use of what looks like a standard response pre-prepared by Wilson or a clerk acting on his behalf leaving gaps to be filled in later, suggests that Wilson was in the habit of over-ruling Lightfoot’s decisions. One of our volunteers wondered how many cases were referred during Lightfoot’s tenure as overseer, before adding, ‘By refusing support he would look to be on the side of the rate payers, and when ordered to pay up by the Quarter Sessions he was not seen to be responsible for the expenditure!’ Perhaps a trawl through the quarter sessions may offer an answer. Equally, are there any other instances of this occurring in other parishes in Cumberland, East Sussex or Staffordshire? Edgar Miller, ‘English pauper lunatics in the era of the old poor law’, History of Psychiatry 23(3) 2012, 321.